Pentagon survivor Lt. Col. Ryan Yantis took part in the Patriot Day Memorial Service at the Union League Club of Chicago along with Don Bacso, who survived the attack on the World Trade Center. "We were going about our day-to-day business looking at New York in case they called for help, when the second plane struck, we were actually watching TV like millions of other Americans," Yantis said. "Right then I knew that we were under attack." Bacso, a Dyer, Ind. resident, was on the 57th floor but able to get out of the North Tower just before it collapsed. "It was disbelief at first, then it was anger, because it was, how could they do this to us, how could they take our commercial jet liners with our people on it and crash it into these buildings," Bacso said. The remembrances of the tragic event are a part of the numerous ceremonies and vigils to pay tribute to the men and women who were injured or lost their lives that day. In north suburban Skokie, flags at the village's fire stations are at half-staff in honor of the day. It's been 13 years since the Sept. 11, 2001 attacks, and most everyone has a personal story to share about the day, including Chicago Mayor Rahm Emanuel, who while giving an interview about the city's technology initiative shared a personal story of seeing that day through the eyes of his then 3-year-old daughter whose birthday is on Sept. 11. "All the neighbors gathered on the sidewalk and we had candles, and we sang the national anthem, 'America the Beautiful,' at three she thought that was her birthday and the next year when she was four she wondered why the neighbors weren't gathering on the sidewalk," Emanuel said. In Naperville, an annual ceremony took place along the town's riverwalk at the Commander Dan Shanower Memorial, named for the native son and Navy man who was killed in the attack on the Pentagon. "We need to keep on the alert for our country and realize that freedom isn't free," said Naperville Mayor George Pradel. Oak Forest residents gathered to dedicate a piece of the World Trade Towers during a ceremony Thursday. In suburban Oak Forest, a piece of one of the World Trade Towers was dedicated. "A piece like this reminds me of what our young men and women are out there fighting for our freedoms. This is a reminder of that," said Oak Forest Mayor Hank Kuspa. Three years ago, Kuspa and others set out to acquire a piece of the remains of the towers. They received artifact C-95, a 400-pound piece of I-beam. No one knows which tower or what floor it came from, but that's not important. What happened on this day is. "We have feelings of emptiness, loss. We were scared, and a lot of us were very angry. Our world stood still that day," said Oak Forest Police Deacon Jim Lewandowski. 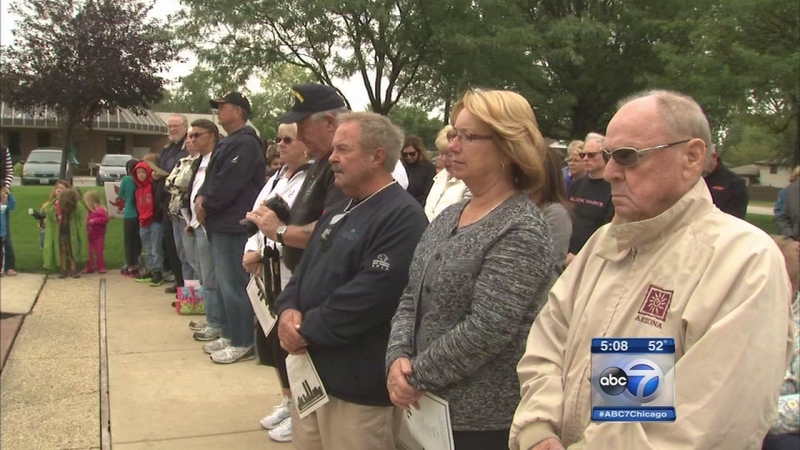 The people of Oak Forest dedicated their new 9/11 memorial Thursday morning. Piece C-95 rests on a stand for all to see, surrounded by a Pentagon-shaped garden. A lasting tribute to those lost, and to those who run to danger when others run from it. "The tragedy and the families and how it effects every one of us to this day - cause we'll never forget. 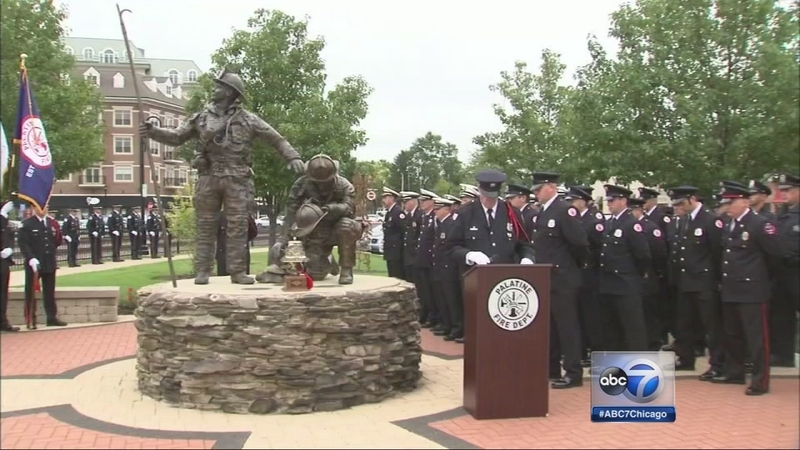 We'll never forget," said Lt. Tim Moss, Oak Forest Fire Department. In that moment of pause, we remember where we were that day when we heard, or saw. But there is a new generation - too young to remember. But they are not too young to know. "I was thinking it was very interesting our town was able to get this piece of history in the U.S.," said Grace Helberg, a Scarlet Oak fourth grader. "It's a piece of the tower that fell down and it's very important so we can remember it and I'm glad a piece of it is still here," said Naya Dobbins, a Scarlett Oak fourth grader. Oak Forest joins over 150 communities that have 9/11 memorials which include actual pieces of the towers. From Dodge City, Kan., to Portugal, they have a worldwide presence as constant touchable reminders of how the world was changed 13 years ago. Palatine residents gathered to mark the anniversary of 9/11 Thursday with a tribute to remember those lost in the terror attacks. Palatine residents also gathered Thursday morning for a 9/11 tribute, a ceremony that was very moving for Mary Smith, a flight attendant who lost five dear friends in the attacks. "On that day, those of us that were flight attendants and I'm sure many others, fire fighters, pilots, were calling each other to figure out who was where," Smith said. "As the names were revealed I began to realize I was very personally connected." The ceremony included a prayer, lowering of the flag, wreath laying, 21-gun salute and bagpipes.